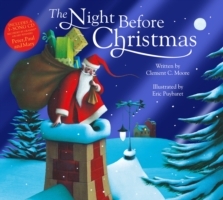 Clement C. Moore’s much-loved classic Christmas poem The Night Before Christmas is brought to life in this gorgeous picture book, which includes a three song CD recorded by award-winning performers Peter, Paul and Mary. The magical artwork by Eric Puybaret is sure to bring visions of sugarplums to everyone’s head. With a fabulous foiled cover, this is the perfect Christmas present for any child.